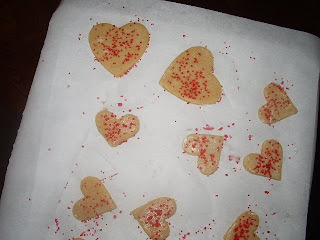 This morning I TRIED to make something special for my family for Valentine's Day. 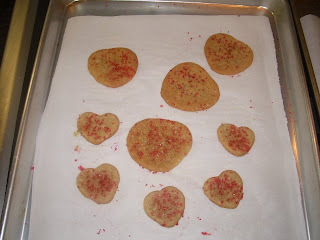 I saw a yummy recipe in Marty Stewart's Feb issue for heart-shaped Ginger Sugared Cookies. I'm not the baker in our family. The LOML is. He likes to bake. He's good at it. I like to eat what he bakes. A match made in heaven. But, I thought he (and the rest of my family) would enjoy being on the receiving end of some baking love. So I tried. Here's what the little pretties looked like going into the oven. Not bad. I was already starting to pat myself on the back. Here's what they looked like coming out of the oven! What!?? They are official Valentine blobs! Seriously, I could have just thrown the dough at the cookie sheet and gotten equal or better results. After having spent the time making the dough, refrigerating it, rolling it, cutting it, sprinkling it, re-refrigerating it and then baking it, I was invested in this little project and was not going to give up. So, I scrounged through my stash and found some glassine envelopes. I packed 5 little "hearts" (the bigger hearts will need to be used in blind taste tests, ephasis on blind) into each envelope, sealed them with some labels I made and wrapped them with baker's twine. 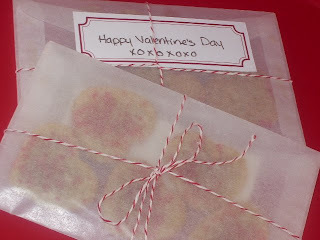 I'm hoping the packaging will work as camouflage and distraction for the cookie-blobs. It's the blob that counts!